Cypress公司的CYW4343W是高度集成单片解决方案,提供业界可穿戴,物联网(IoT)网关,家庭自动化和各种手持设备的最低的RBOM.器件包括有2.4 GHz WLAN IEEE 802.11 b/g/n MAC/基带/无线电和支持蓝牙4.1.此外还集成了功率放大器(PA),低噪音放大器(LNA),发送/接收(iTR)RF开关,从而进一步降低解决方案成本和PCB面积.Future公司的NebulaIoT云开发板用来开发无联网(IoT)生态系统.本文介绍了Cypress公司的 CYW4343W主要特性和框图,以及Future公司的NebulaIoT云开发板主要特性,电路图和PCB设计图. The Cypress CYW4343W is a highly integrated single-chip solution and offers the lowest RBOM in the industry for wearables, Internetof Things (IoT) gateways, home automation, and a wide range of other portable devices. 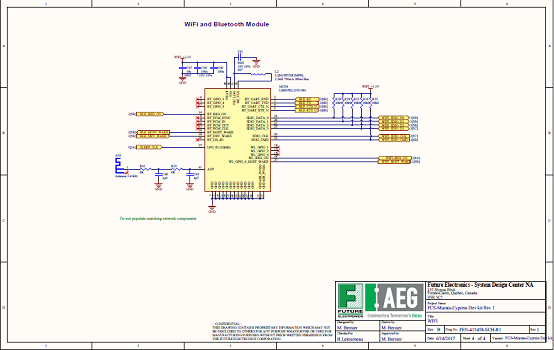 The chip includes a 2.4 GHz WLAN IEEE 802.11 b/g/n MAC/baseband/radio and Bluetooth 4.1 support. 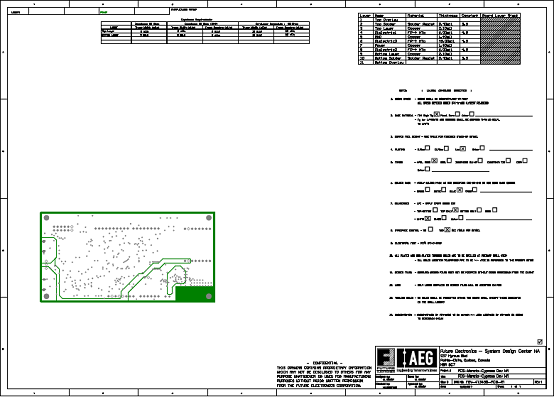 In addition, it integrates a power amplifier (PA) that meets the outputpower requirements of most handheld systems, a low-noise amplifier (LNA) for best-in-class receiver sensitivity, and an internaltransmit/receive (iTR) RF switch, further reducing the overall solution cost and printed circuit board area. The WLAN host interface supports SDIO v2.0 mode, providing a raw data transfer rate up to 200 Mbps when operating in 4-bit modeat a 50 MHz bus frequency. An independent, high-speed UART is provided for the Bluetooth host interface.Using advanced design techniques and process technology to reduce active and idle power, the CYW4343W is designed to address the needs of highly mobiledevices that require minimal power consumption and compact size. It includes a power management unit that simplifies the systempower topology and allows for operation directly from a rechargeable mobile platform battery while maximizing battery life. The CYW4343W implements the world’s most advanced Enhanced Collaborative Coexistence algorithms and hardware mechanisms,allowing for an extremely collaborative WLAN and Bluetooth coexistence. ■ Single-band 2.4 GHz IEEE 802.11b/g/n. ■ Support for 2.4 GHz Cypress TurboQAM® data rates (256-QAM) and 20 MHz channel bandwidth. ■ Integrated iTR switch supports a single 2.4 GHz antennashared between WLAN and Bluetooth. ■ Tx and Rx Low-density Parity Check (LDPC) support forimproved range and power efficiency. ■ Supports standard SDIO v2.0 host interface. ■ Supports Space-Time Block Coding (STBC) in the receiver. ■ Integrated ARM Cortex-M3 processor and on-chip memory forcomplete WLAN subsystem functionality, minimizing the needto wake up the applications processor for standard WLANfunctions. This allows for further minimization of powerconsumption, while maintaining the ability to field-upgrade withfuture features. 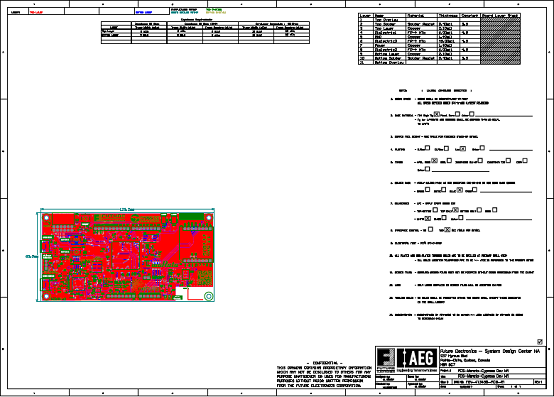 On-chip memory includes 512 KB SRAM and640 KB ROM. ■ OneDriver™ software architecture for easy migration fromexisting embedded WLAN and Bluetooth devices as well as tofuture devices. ■ Complies with Bluetooth Core Specification Version 4.1 withprovisions for supporting future specifications. ■ Bluetooth Class 1 or Class 2 transmitter operation. ■ Supports extended Synchronous Connections (eSCO), forenhanced voice quality by allowing for retransmission ofdropped packets. ■ Adaptive Frequency Hopping (AFH) for reducing radiofrequency interference. 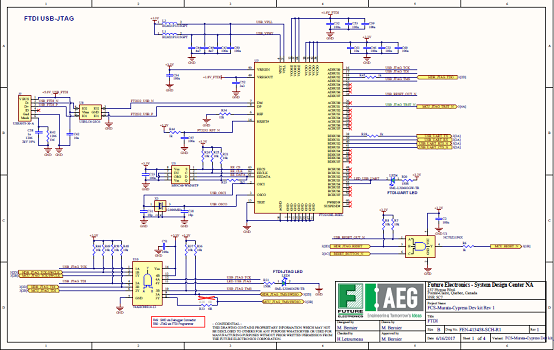 ■ Interface support ― Host Controller Interface (HCI) using ahigh-speed UART interface and PCM for audio data. ■ Low-power consumption improves battery life of handhelddevices. 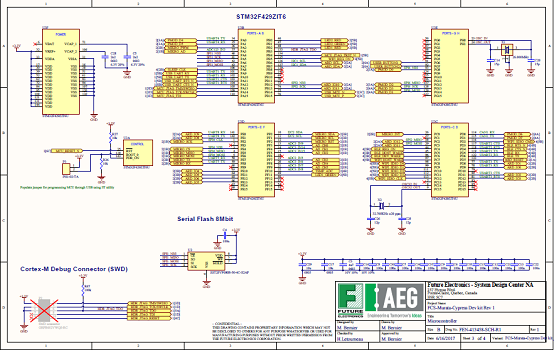 ■ Supports multiple simultaneous Advanced Audio DistributionProfiles (A2DP) for stereo sound. ■ Automatic frequency detection for standard crystal and TCXOvalues. ■ Supports a battery voltage range from 3.0V to 4.8V with aninternal switching regulator. 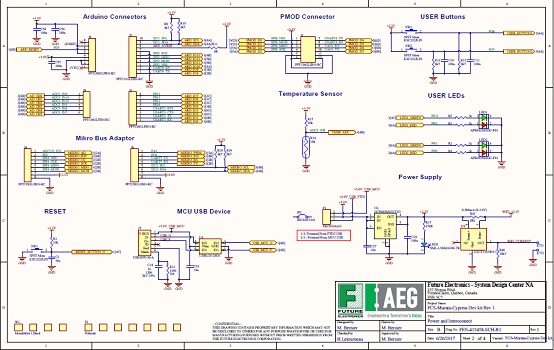 ■ Programmable dynamic power management. 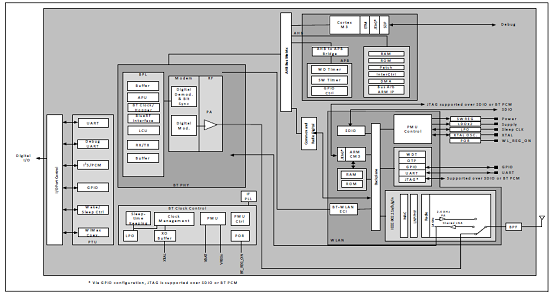 ■ 4 Kbit One-Time Programmable (OTP) memory for storingboard parameters. ■ Can be routed on low-cost 1 x 1 PCB stack-ups. ■ 74-ball[4343W+43CS4343W1]74-ball 63-ball WLBGApackage (4.87 mm × 2.87 mm, 0.4 mm pitch). 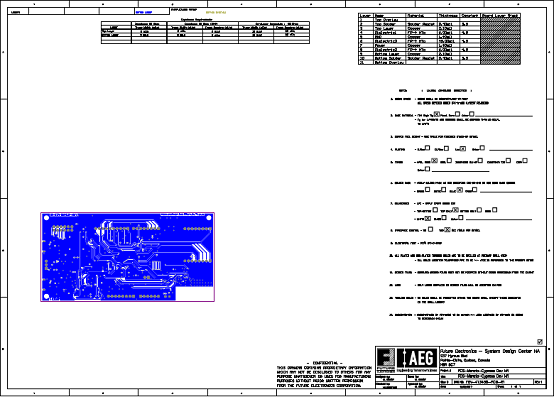 ■ 153-bump WLCSP package (115 μm bump diameter, 180 μmbump pitch). ❐WPA and WPA2 (Personal) support for powerful encryptionand authentication. ❐AES in WLAN hardware for faster data encryption and IEEE802.11i compatibility. ❐Reference WLAN subsystem provides Cisco Compatible Extensions(CCX, CCX 2.0, CCX 3.0, CCX 4.0, CCX 5.0). ❐Reference WLAN subsystem provides Wi�CFi Protected Setup(WPS). ■ Worldwide regulatory support: Global products supported withworldwide homologated design. ❐SDIO v2.0, including default and high-speed timing. ■ BT UART (up to 4 Mbps) host digital interface that can be used concurrently with the above WLAN host interfaces. ■ ECI―enhanced coexistence support, which coordinates BT SCO transmissions around WLAN receptions. ■ Bluetooth SmartAudio® technology improves voice and music quality to headsets. ■ IEEE 802.15.2 Coexistence Compliance ― on silicon solution compliant with IEEE 3-wire requirements. The Nebula™ board is an IoT cloud ready board which allows developers to quickly prototype and deploy their IoT ecosystems. Wireless connectivity is supported by the Murata 1DX module which is powered by the Cypress CYW4343W Wi-Fi (802.11 b/g/n) and Bluetooth Smart Ready (V4.1 +EDR) chipset radio. The module is designed to fit into small spaces and is smaller than a dime. 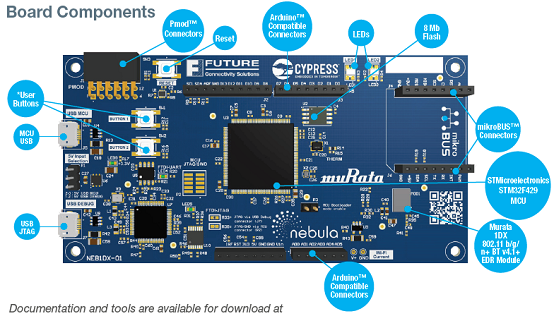 The Nebula™ is driven by the STM32F429 ARM Cortex-M4 Microcontroller and includes 8 Mb of serial flash. 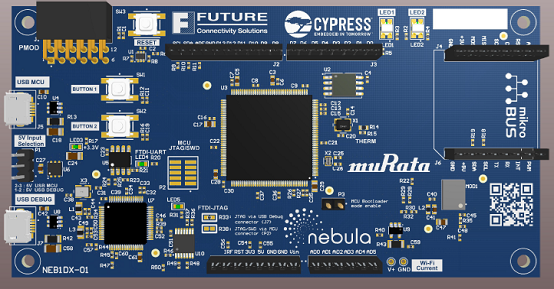 The NebulaTMboard supports application development through Cypress’WICED (Wireless Internet Connectivity for Embedded Devices) platform. WICED is the only SDK that combines wireless, MCUs and memory in one environment that runs on Windows, OS X and Linux through Eclipse-based IDE. The NebulaTMboard has been designed for novices and expert developers alike looking to explore the vast opportunities in IoT appli­cations such as asset tracking, energy man­agement, fitness, lighting controls, HVAC, portable controls, security and building automation. Explores easy hardware expandability through a large number of standardized add-on boards via the Arduino™, Pmod™ and mikroBUS™ connectors. Each board focusing on a different application such as motor controls, sensors and wireless connectivity to enable IoT development.